Unfortunately I won’t be in a position to do a half decent write up until much later in the week so below are the usual battery of stats/tables. I will do up a write up at some stage and post it here – mainly for reference when these teams meet in 2018!!! O’Connor’s free at the end was outside his range – see the preview. It is so harsh on O’Connor that he takes a hit for stepping up to cover his team’s deficiencies and in some way lessens what he does elsewhere – see his brilliant long range point to draw the game level at the end. Mayo’s shooting was not poor! It was better than both 2016 AI Finals … it was just that Dublin’s shooting was exceptional. At one stage in the second half they were 0 – 11 from 12 for a Conversion Rate of 92%. Collective ice in their veins. We’ll get into the constituent parts below but as a collective Dublin have returned a whopping 61% Conversion Rate so far in 2017. The 188 shots they have attempted has netted them 19 points more (Expt Pts +19.05) than the average intercounty team would have scored. This Dublin attack is rolling. Table 1 in the Appendix shows the breakdown per player but as a collective over two thirds (+13.87) of Dublin’s positive Expt Pts has come from their point attempts from play. The average Conversion Rate over the past 5 years has been 46%; thus far Dublin have returned 56%. The question is not how good they are – we know they are exceptional – but whether they can maintain that level of production? And it is an open question as we have seen this before. Coming into both the 2015 and 2016 finals Dublin’s forwards were also flying with pre final Conversion Rates of 57% in 2015 (Expt Pts +17.63) and 51% in 2016 (Expt Pts +8.25). In the 2015 final they were impressive in maintaining their high returns with a 57% Conversion Rate (0 – 08 from 14) and a one game Expt Pts of +1.57 (in poor weather it must be remembered). However in the two games against Mayo last year they stumbled to a very poor 37% (0 – 14 from 38; Expt Pts -4.72). The question is whether this stumble was induced by facing Mayo or was it more of a Dublin blip? There is no way to categorically state either way but looking from the outside I would give Mayo a great deal of credit. Coming into the 2016 final Mayo, in their six games, had allowed a Conversion Rate of 41% (0 – 45 from 109) as opposed to the 51% Dublin had been putting up. 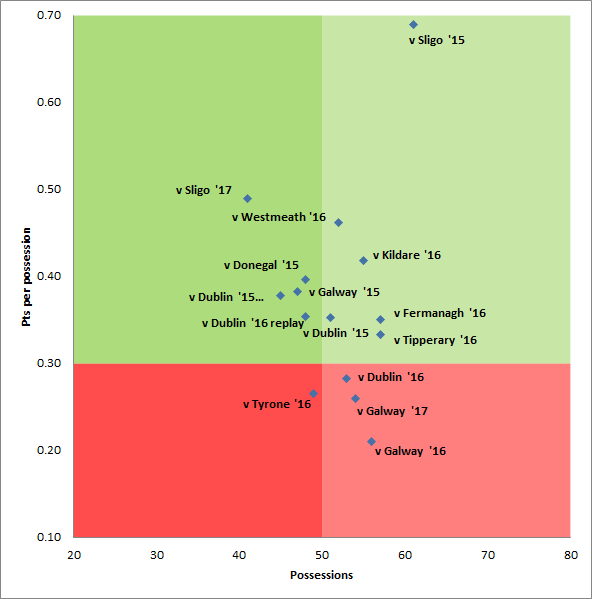 Across the two games the 37% Dublin achieved was much more in line with what Mayo had been allowing. We have a similar scenario this year. Dublin are flying with the aforementioned Conversion Rate of 56% but again over a nine game span Mayo’s defence have only allowed a Conversion Rate of 41% (which, as an aside, shows remarkable consistency year to year). Can Mayo repeat their 2016 trick and “drag” Dublin’s Conversion Rate down in the final? In an effort to explain the drop in Dublin’s shooting I created a pressure index (see Note1) and noted that Mayo were consistent across the two games in applying strong or severe pressure to just under half of Dublin’s point attempts (45% in the drawn game and 44% in the replay). In 2017 – across the nine games – Mayo have applied strong or severe pressure to 46% of their opponents point attempts. This has risen to 59% in the last four games. So we know that Dublin can shoot and that they can carry it over (2015 final) however we also know that Mayo stymied them in both games last year and that the pressure index for their 2017 season is trending upwards. One difference, for Dublin, observed when comparing this year to the last two All Irelands is just who is taking the shots. Below are the top 5 point takers coming into the last three finals and whilst there was a change from ’15 to ’16 the new entrants then were generally known quantities in McManamon & Rock. With Connolly suspended and Brogan & McManamon mainly coming off the bench there is a newer, fresher, look to the Dublin strike force. Mannion & Andrews are well known to the Mayo defenders at this stage but O’Callaghan – despite there being a mountain of video evidence on him – is new and may cause the Mayo defenders to sit off initially; remember it was the relatively unknown Costelloe off the bench that did the damage in last year’s replay. Given their experience, both last year and in their run to the final this year, Mayo may believe that they can handle the Dublin forwards. But what they will have to be very conscious of is fouling. Rock had a poor day in last year’s drawn game (0 – 03 from 7 (43%); Expt Pts of -1.58) but was then devastating in the replay (0 – 07 from 7 with an Expt Pts of +1.58). He, and Dublin as a whole, have maintained this form throughout the 2017 Championship returning a barely credible 94% Conversion Rate (0 – 33 from 35) with an Expt Pts of +6.43 (see Chart 1 in the Appendix). A special note of praise for Rock here. Although he had an off day in the 2016 drawn final he has been phenomenal since basically being removed from free taking duties at the back end of 2015. In 11 Championship games since the start of 2016 he is 92% and as the below graphic shows he is not only consistent “inside” where he is 96% but also outside (75%). Not only has he accuracy but he has accuracy with length. Mayo cannot hope that the Rock from the drawn 2016 final appears. Instead they must expect that the Rock we have seen from the start of 2016, and in the 2016 replay, shows up. They gave up seven scoreable frees in the replay; in 2017 they have given up an average of 6.6 shots at goal from frees. Unless defending a lead their target has to be to minimise Rock’s opportunities from frees to seven or less. Dublin have – surprisingly given their opposition and reputation – only been average on goal attempts. In 2015 they were averaging 6.0 shots at goal per game but had a phenomenal 60% Conversion Rate (18 – 04 from 30). In 2016 this reduced dramatically to 2.2 attempts & a 46% (5 – 00 from 11) Conversion Rate. So far this year it is back up to 5.0 attempts a game but with a basically average Conversion Rate of 36% (9 – 01 from 25). In the 2015 final they manufactured 4 goal attempts but couldn’t convert any whilst in the two 2016 games they only created four distinct attempts at goal – but did manage to score in the most unconventional manner! It’s all a bit of a rollercoaster. I think it is fair to say that Dublin are a lot less goal hungry than previous incarnations but this year has seen them somewhat pick up their attempts per game. Whereas Dublin are on fire Mayo have been hotter and colder, both from game to game and within games, than any other team. They returned a Conversion Rate of 41% against Galway and 71% against Cork; they scored 1 – 09 from just 12 shots in extra time against Derry after producing 0 – 01 from 15 attempts in a 25 minute spell in the second half. Against Cork they scored 0 -14 from their first 15 point attempts from play. Looking at the nine games in the round (see Table 2 in the appendix) however we can say that their point taking has been just above average (50% Conversion Rate; +2.21 Expt Pts). But this is a step up on their 2016 campaign (46% Conversion Rate; +1.62). There’s a slight anomaly in the above figures in that Mayo’s Conversion Rate has increased but the Expt Pts has remained more or less static. That’s because Mayo have attempted much more shots from central locations this year compared to last year. In a most Un-Mayo like fashion they have made life easier on themselves! If we run an imaginary line vertically from the outer edges of the D to the 45m line we create a central channel. In 2016 34% of Mayo’s point attempts came from inside this channel. In 2017 this has risen to 51%. Another notable point re Mayo’s shooting is that the “back-up”, the next ten players by shot volume (see Table2 in the Appendix), have been as accurate as Moran & C O’Connor with a 53% Conversion Rate (0 – 55 from 104) compared to Moran/C O’Connor’s 54% (0-34 from 63). Have Mayo got two top shooters? Yes. Have they ready-made, volume based replacements if they are shut down? No. Can the workload be spread and the efficiency maintained if they are shut down? Yes. What of the Dublin defence? Coming into the 2016 final Mayo were running at an about average Conversion Rate of 45% (Expt Pts +0.89). For the two finals their combined numbers were 0 – 14 from 31 (Conversion Rate of 45%; Expt Pts of +0.22). The sample size is small but Dublin’s defence had no real additional effect on Mayo’s efficiency – Mayo carried over their conversion rate. Where they did have an effect however was in limiting the attempts Mayo had. Coming into the 2016 final Mayo had taken 20.7 point attempts per game. In the final this dropped to 15.5. This year so far Mayo have averaged (again with remarkable consistency) 20.5 point attempts per game. In 2016 Dublin – prior to the final – had allowed the opposition to take 16.6 point attempts per game but this has risen to 18.6 in 2017. So not only has Mayo’s efficiency on the same volume of shots increased but Dublin are allowing more shots and (in 2016 at least) didn’t have an effect on Mayo’s efficiency. C O’Connor has been rock steady on frees throughout his career converting, when the pressure has been at its most intense, 86% (0-55 from 64 Expt Pts of +4.99) in semi-final and finals alone from 2012 to 2016. His range does appear to have shortened however. The above chart shows C O’Connor’s 2017 frees in yellow and using the same boundaries as the Rock chart above we can see that O’Connor is as good as ever “inside”. He has recorded very similar numbers to Rock at 95% (0 – 35 from 37) however he has definitely struggled “outside” recording a very poor (relatively speaking) 35%. 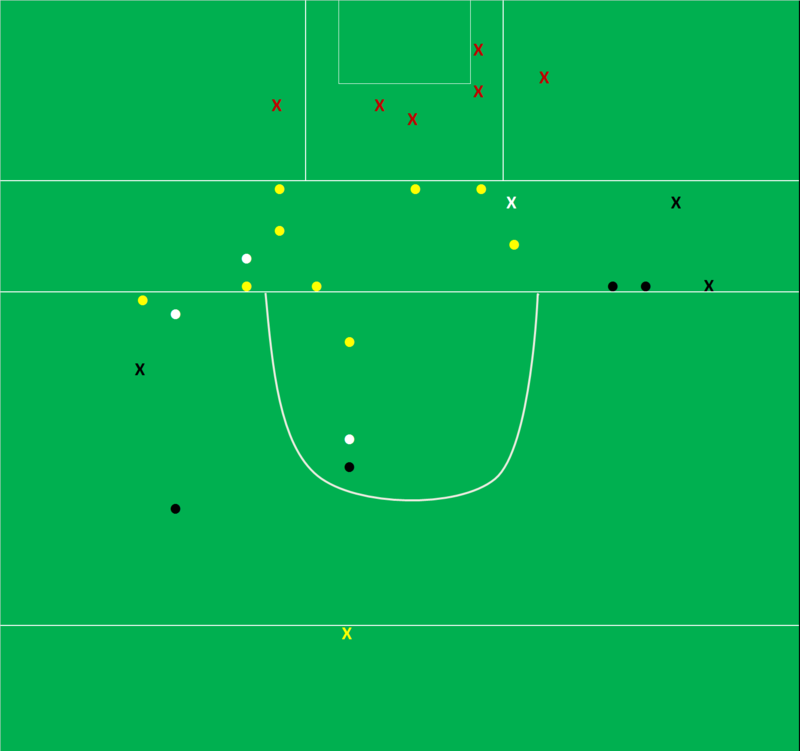 The two black dots on the chart are Jason Doherty’s attempts in the semi-final replay versus Kerry whilst the red cross is the free that O’Connor missed at the death in last year’s replay. As discussed at the time you would not have wanted anyone else standing over that free given his performance in the most pressurised of stages previously but it was definitely on the outer edge of his range. Given his range limitations, his record this year and how comfortable Doherty looked the last day surely there’s a case for handing over the longer range attempts? Apart from C O’Connor’s range – which does look to have a ready-made alternative should Mayo wish to employ Doherty – another area of concern would be frees from the right. Attempts from this area are sparse in the above chart (C O’Connor handed the ball to Moran for at least one free from this area against Kerry) as you would imagine C O’Connor is only too aware of his limitations. The issue was only exasperated by McLoughlin missing his two frees from inside the 20m on the right against Derry and Sligo. Everyone knows O’Connor doesn’t want to take frees from wide right whilst the alternative, in McLoughlin, has, being kind, been shaky. Mayo know this is a weakness. We know it. You can be damn well sure that the Dublin defence knows it too. Mayo have been slightly below Dublin in their attempts per game at 4.2 however have been ahead of Dublin with a Conversion Rate of 42% (16 – 03 from 38 attempts). In the round that’s 5.6pts per game from both for their goal attempts (Dublin 5.60, Mayo 5.67). One of the most eagerly anticipated duals will be the kickouts. How successful will Mayo be at getting their, what at times look extremely dicey, short kickouts away? Will they push up on Dublin? Once won how good will each team be at manoeuvring the subsequent possession into a shot and score? To date Dublin have gone short (see Note 2) on 66% (63 from 96) of their kickouts winning them all and managing to produce a shot from 73% which resulted in 3-27. That’s 0.57 points for every kickout won. Which is incredible. The returns for all other kickouts won is 0.45 – which doesn’t account for the kickouts the lost when the ball went past the 45 – whilst Mayo are a net (unlike Dublin they have lost 9 of their own short kickouts which has resulted in the opposition getting 0 – 03) 0.33 points per short kickout. You have to imagine that Mayo will look to disrupt this wherever they can. To date 50% of the opposition’s kickouts have gone short in Mayo games with the opposition getting 0.31 points per kickout won. Mayo have gotten their hands on 10% (12 out of 120) of the opposition’s kickouts and when they do they go for goal – scoring 2 – 03 off those 12. In the two finals last year Dublin had a similar split to this year in that 65% of their kickouts went short but Mayo had much more success keeping Dublin to just 0.12 points per short kickout won (0 – 03 off 25). And that’s without referencing the two short ones that Mayo won. When we compare this to what Dublin have done to date in the 2017 Championship you have to believe that whilst Mayo may not be able to stop Dublin completely, and may not be able to clamp down as rigidly as they did last year, they should at least provide a much more substantial obstacle than Dublin have faced hitherto fore. Across both 2016 games Mayo lost five (17%) of their 29 short kickouts against Dublin including two at the death of the drawn game that surely had a part to play in Clarke being dropped for the replay. Clarke is now firmly ensconced as Mayo’s No.1 but the short kickout roulette can still occur at any moment as they have lost 9 across six different games. Mayo have been somewhat fortunate in that none of those 14 lost short kickouts (5 against Dublin and 9 this year) have resulted in a goal – instead 0 – 08 has come from them – but it is only a matter of time. But Mayo will continue to roll that dice, even in the face of the Dublin pressure, as it has served them well overall. Whilst not as spectacular as Dublin’s 0.57 Mayo have returned 0.39 points for every short kickout won this year. That does rise to 0.43 for their own kickouts that they win past the 45 however they only win 63% of these – for all the anxiety they give their fans on the short ones they are still winning 90%. It’s almost a no brainer. No matter how many palpitations they give you if your returns are the same on the short ones as on the longer ones but you win more of the short ones – well you keep going short. That is until you give away the inevitable calamitous goal … let’s hope for Mayo’s sake their luck holds for one more game. It does come with a warning as it is subjective but seeing as there is only one person applying the metric you would expect that there would be a level of consistency when a large enough volume of shots is reviewed. Unfortuantely I haven’t been able to get to the game and at this stage there really is nothing I can add to the commentary that is already out there. Both teams had similar possession volumes (56 for Roscommon to Mayo’s 54) as well as Attack Rates (77% v 78%). 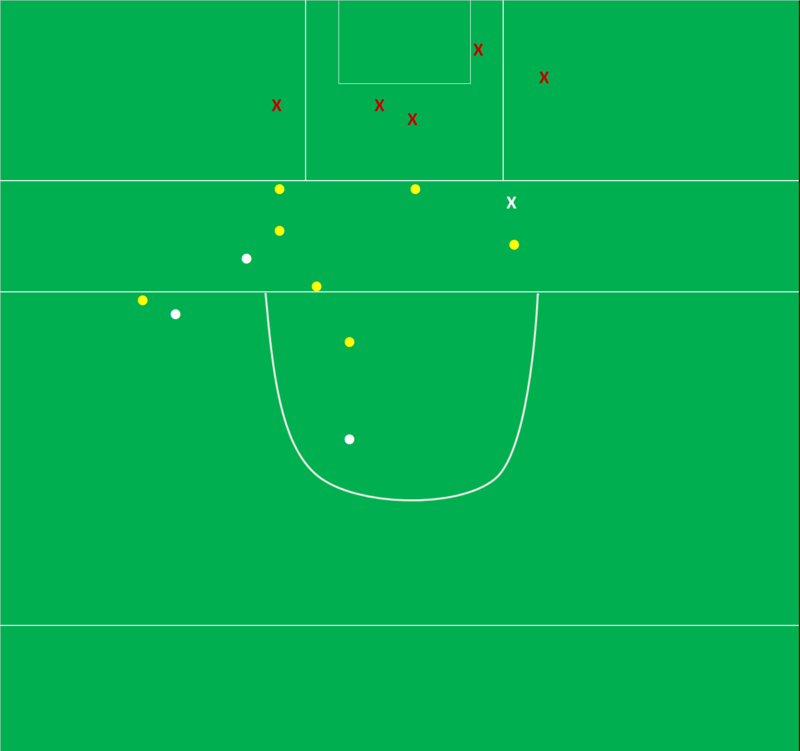 Once inside the 45 there was a divergence however with Mayo getting more shots off (29 to Roscommon’s 25). As an aside 110 possessions is high but not inordinately so. Across 54 games in 2015 and 2016 I have eight with a higher possession total including the 2015 final between Kerry & Dublin which was played in similarly wet conditions. The Connacht game ths year between Mayo & Galway had 113. As ever we start with Cillian O’Connor. One of his less auspicious days with a total Conversion Rate of 27% (0 – 03 from 11; Expt Pts – 2.91) and just 14% from play (0 – 01 from 7; Expt Pts -1.94). In eight games in 2016 he returned a combined conversion rate of 62% (0 – 44 from 71) with an Expt Pts tally of -0.93. As ever his appetite for work and willingness to offer himself up as an option were evident as he took four of Mayo’s last six shots (Durcan took the other two) from the 65th minute onwards. One of these shots was a free from well outside his range whilst the other three were central enough however two were taken under strong or intense pressure. Indeed five of his seven attempts from play were heavily pressurised. If you’re Mayo you probably want O’Connor on the ball at the death but the opposition are well aware of this. In a down game for O’Connor Lee Keegan almost single-handedly dragged Mayo back from the abyss scoring 1 – 03 from just five shots (80% Conversion Rate; Expt Pts +3.25). The goal was a prime example of split second decision making that can win/lose/decide games. In the above Keegan’s (5) marker Enda Smith (9) gets sucked into the kickout melee unaware that Doherty has claimed a mark. Keegan sees it and immediately sets off behind Smith’s back. McDermott (Roscommon defender pointing) sees the danger but it is too late. Keegan is gone with nothing but open road in front of him. The remainder of the Mayo team were average scoring 0 – 06 from 13 (46% Conversion Rate; Expt Pts of +0.10). None of the starting trio of McLoughlin, A O’Shea or S O’Shea managed a shot whilst only Tom Parsons produced one off the bench. Mayo will definitely be looking for more of a threat here the next day. On McLoughlin & A O’Shea the fact that they didn’t get a shot off does not necessarily mean they had a poor game. Both were very involved higher up the pitch as evidenced by the assist chart. Roscommon’s defence may be slightly disappointed in the fact that 46% (11 of 24) of Mayo’s shots were taken under little or no pressure however on the flip side they will be delighted in where they forced Mayo to shoot from. 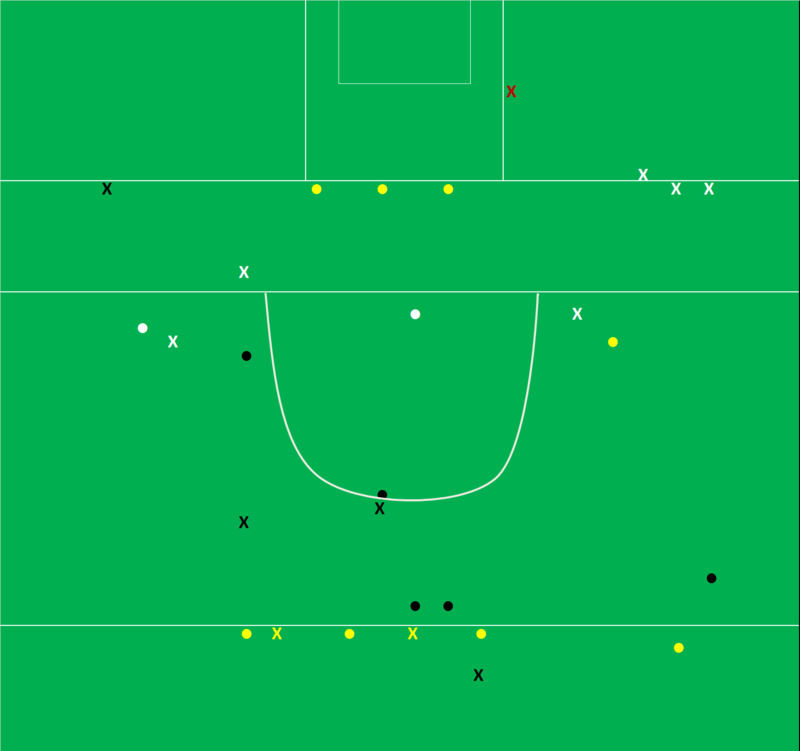 Mayo never really got through them or around the side – the vast majority of shots were from “outside”. At a macro level Roscommon’s shooting was very good with them scoring ~1.7 points more than the shots they attempted would normally return. But their Conversion Rate was essentially average at 46% and therein lies a problem. Their high returns from goal attempts (2 – 00 from 2) masks how poor their shooting in general was. They had 16 point attempts from play and returned just 0 – 05 (31% Conversion Rate; Expt Pts -2.42). It is quite possible, in a one off game in the replay, that they will again create more goal chances than Mayo and convert them all. It is much more likely however that they will revert to the mean on their goal attempt conversions and thus they will have to rely more heavily on the point taking (be that from play of from frees). One point to note here is the affect that Mayo’s defence had on Roscommon. Above we showed how Roscommon helped themselves by keeping Mayo, in the main, on the outer perimeter. 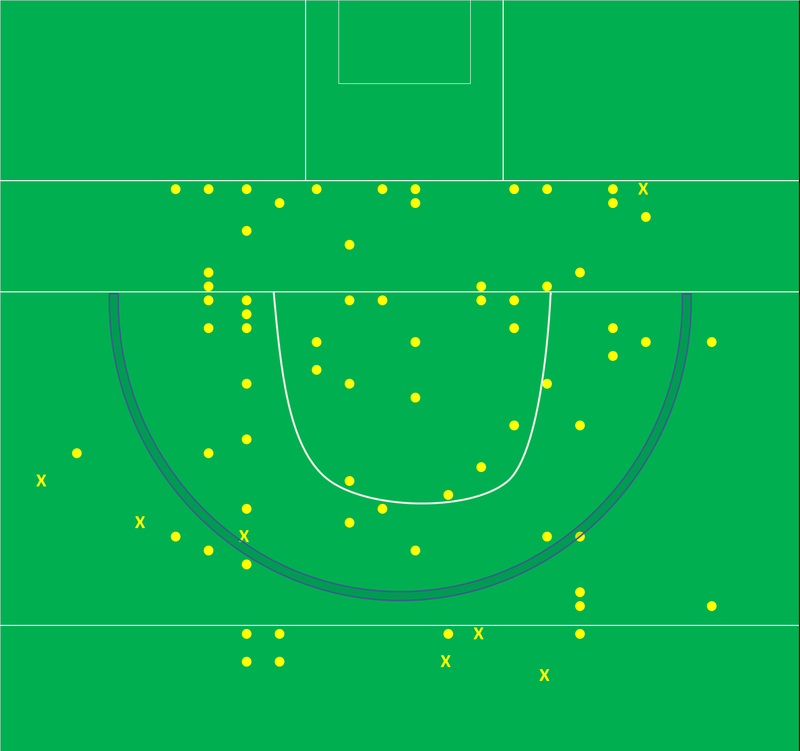 Roscommon got inside Mayo more often (see shot chart below) but the Mayo defense deserves credit as they heavily pressurised 75% (12 of 16) of Roscommon’s point attempts. 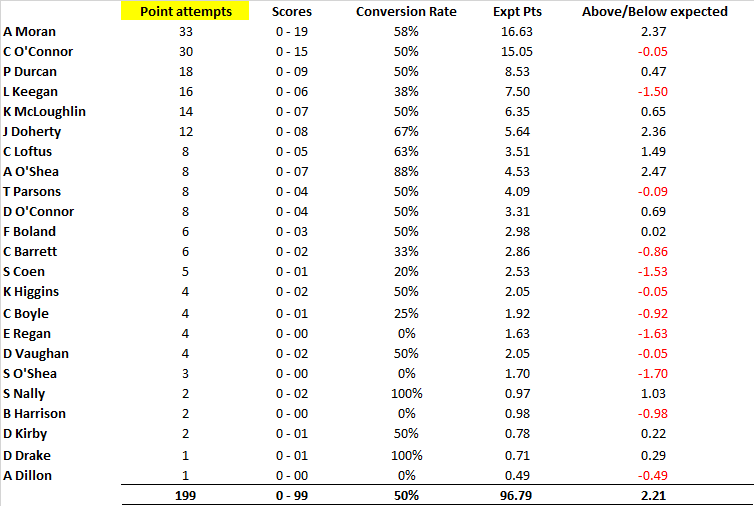 This included a ~35 minute period post the second goal where they heavily pressurised 8 of Roscommon’s next 10 point attempts leading to Roscommon returns of 10% Conversion Rate (0 – 01 from 10) with a combined Expt Pts of -3.31. Now undoubtedly there was “scoreboard pressure” as Mayo overturned the 7 point deficit that led to poor decisions and execution in the shots but Mayo definitely aided those poor decisions. 75% heavy pressure is high and at times they walked a bit of a tightrope offering up six attempts from a free with four coming inside the 45 – but you’ll take a combined return of 41% ( 0 – 09 from 22) from all point attempts. Very even all told. 20 kickouts went passed the 45 with both teams winning 10 each. As with the general trend mentioned above Mayo were better at converting those possessions to shots. In an interview post the Cork game Rochford mentioned, in assessing A O’Shea’s impact, how he had aided smaller things such as winning the throw in. Here Roscommon not only won both throw ins but scored off both as well. Outside of a few extra possessions both sides had an eerily similar outing to that of their 2016 encounter. 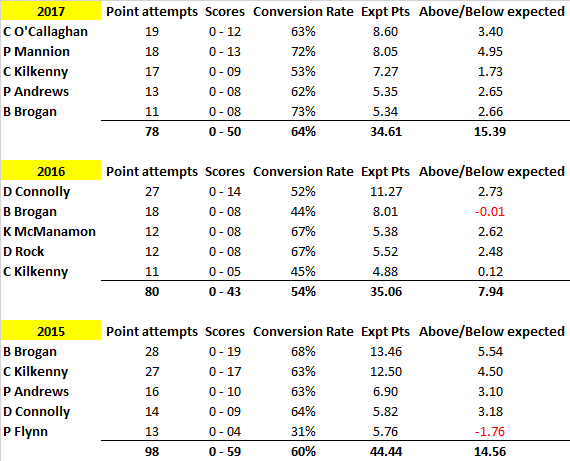 In that game Galway had a 64% attack rate (v 63% here), 78% shot rate (v 76%) and a 52% conversion rate (v 54%) though their Expt Pts at ~11 was much lower in 2016 than the ~15 points here. Part of that divergence in Expt Pts was the fact that in 2016 Galway scored 1 – 01 from their two goal chances; here they missed the one lone attempt, from a relatively acute angle, by Gary O’Donnell early in the second half. Those three shots alone equate to a swing of 2.79 Expt Pts. What of Mayo? In 2016 they recorded an attack rate of 79% (v 72% here) and a shot rate of 66% (v 74%). A slight adjustment on how they moved the ball in that they got inside Galway’s 45 at a lesser rate but managed more shots whilst in there however ultimately the net result was the same – 29 shots in both games. Again there are similarities in their shooting; getting 12 scores in both games for a conversion rate of 41% whilst the Expt pts was -2.89 in 2017 and -3.20 in 2016. Mayo’s goal & deadball attempts were average – which given the prevailing conditions in Salthill was probably better than could be expected. They scored 1 goal from their three attempts whilst Cillian O’Connor returned 0 – 05 from his 7 deadball attempts with both misses coming from the 45 and beyond. As stated a reasonable, acceptable, standard day. What let them down, badly, was their point taking. In total they scored 0 – 06 from 19 attempts for a conversion rate of 32% (Expt Pts of -2.78). You could blame the conditions – and they were very difficult – but Galway had a stat line of 0 – 07 from 17 (41% conversion rate; -0.30 Expt Pts. Basically average). You could also blame shot selection but again the Expt Pts shows that they should have returned 0 -10 from the shots attempted. Where they took their shots from was not an issue. There was a degree of difficulty added by the conditions but nothing that would compensate for such poor returns. What adds to the fact that it was Mayo – and not some other criteria – is the fact that it mirrored 2016. Then Mayo scored 0 – 05 from 19 attempts (26% conversion rate; Ext Pts of -4.20). Mayo’s wider attacking malaise can be further illustrated by the fact that Cillian O’Connor had 10 attempts across the two games (26% of Mayo’s total) but only scored 0 – 01 (Ext Pts of -4.21). There’s no question re his fight, desire, willingness to go to the final minute but when he’s not converting Mayo will struggle as there is no one else to pick up the slack. Be that in a volume or an accuracy sense. Can we attribute any of Mayo’s poor shooting to Galway’s defence? Surely it cannot be a coincidence that two of Mayo’s worst offensive displays – production wise – occurred against Galway? Firstly Johnny Heaney was heroic here in blocking the two goal attempts – if either one of those go in the narrative (that dreaded word) around this game is very different. We can definitely chalk that up to the defence! 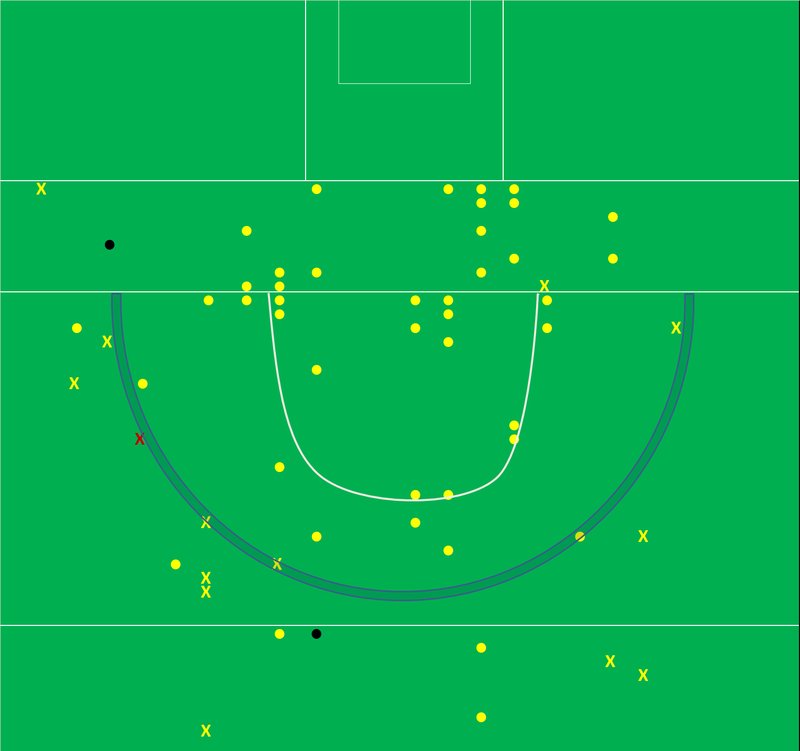 Perhaps a more repeatable marker is that 13 of Mayo’s 19 (68%) point attempts were taken under strong or severe pressure. We have only just started to properly grade this pressure metric but as a reference Mayo recorded 50% & 44% “high” levels of pressure on Dublin’s point attempts in the 2016 final and replay. I’ve no doubt 66% will be on the high side come year end. Galway were excellent at pressurising the Mayo shooter. 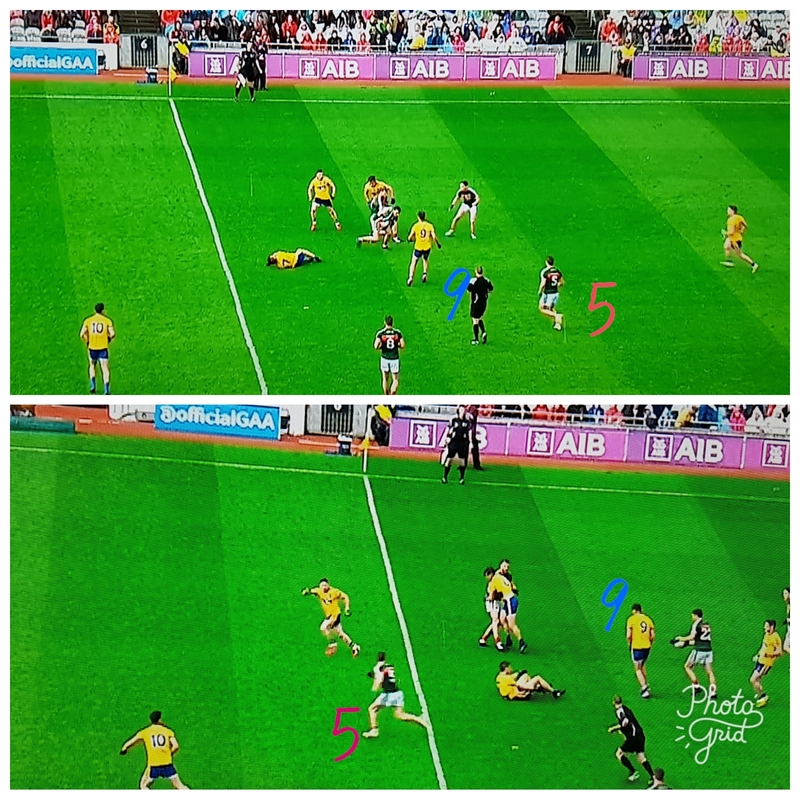 … and yet it was not all down to Galway; Mayo missed all 6 attempts that were taken under little or no pressure …. 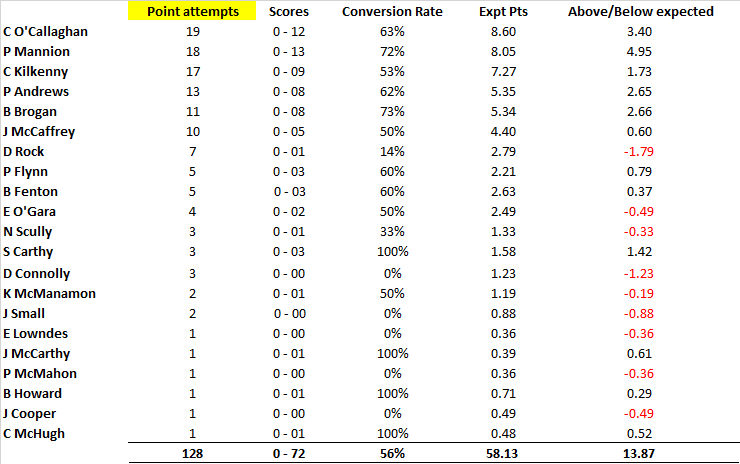 Galway’s shooting from play was average; 0 – 07 from 17 attempts for a 41% Conversion Rate and an Expt Pts return of -0.30. Again given the condition this was quite good. What was very good however was their deadball striking. In total they returned 0 – 08 from their 10 deadball attempts with Armstrong returning a very good 0 – 06 from 8 (including 3 from 3 on frees and an overall Expt Pts tally of +0.86; his excellent striking basically added 1pt above what an average day would have returned). Normally this would be a place to bash any defence that gave up 10 frees but in this instance 5 of those deadballs were 45s. 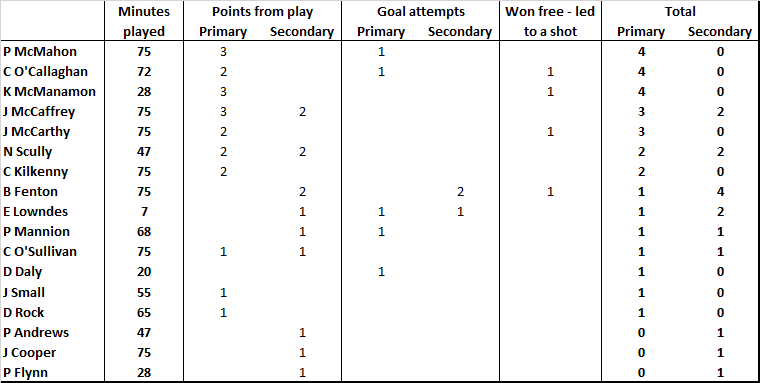 These can be attributed to player or defence on an individual basis but you are quite unlucky to give up 5 in a game where the opposition only has one shot on goal. Both teams diced with death at times losing a combined 6 of their 26 short kickouts. Galway had the best ultimate return here however scoring 0 – 03 directly from these short kickouts. Mayo didn’t manage to return anything from the two Galway short ones they won. 14 (35%) of all the kickouts went past the 45 with honours being split evenly at 7 apiece. Unsurprisingly, given the high turnover rate within the game, only 3 of these 14 possessions progressed to a shot. That is as comfortable a game as a team is likely to have. Tyrone had 9 more possessions, 11 more attacks and a whopping 16 more shots than Derry. There are examples of such disparities where teams begin to rack up numbers towards the back end of a game, as the competitive edge has gone out of the encounter, but (sadly) this was not the case here. When the game was – notionally – at its most competitive in the first half Tyrone had six more attacks and eight more shots. Derry had 18 attempts for a point from play throughout the game; only two of those came from inside the prime scoring zone (extending from the D in towards the goal) with none at all in the 2nd half. Outside of this only one other point attempt came from inside the 20m line. Derry’s fundamental lack of attacking speed allowed Tyrone to set defensively which in turn aided them in repelling Derry away from the most productive shooting zones. Derry were then forced to try less productive long range efforts. 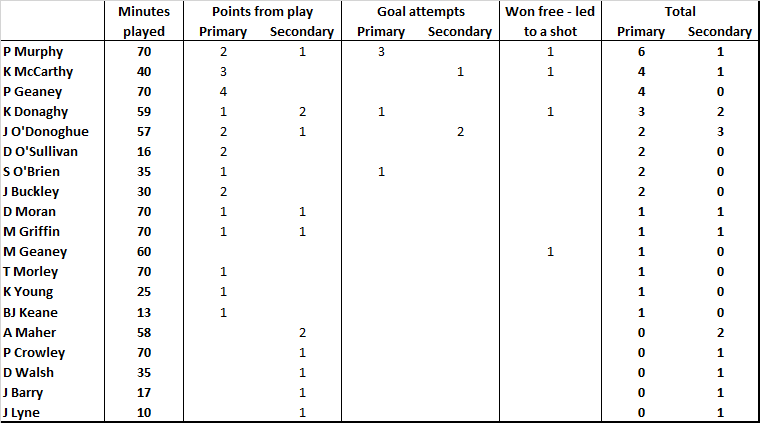 Below are the Derry point attempts from play in the first half. Their whole game shot chart is in the Appendix. You can’t keep doing the same thing over and over and expect different results. Tyrone had their way with the Derry defence returning a 92% Attack Rate & an 86% Shot Rate. This was off an already enlarged possession total. What will (should!) concern them however is – as ever – their shooting. A score of 0 – 22 looks very impressive but with the chances they had they should have scored more (total Ext Pts of -1.59) – the high score was as a result of volume rather than accuracy. It could be argued that this view – that they had a poor shooting outing – is on the harsh end as the negative Expt Pts return includes their two goal attempts being blocked/saved as well as some simple frees being missed (Harte’s left footed effort in the first minute being a prime example). When we only review point attempts from play the view is somewhat rosier; 0 – 13 from 27 attempts (an average. conversion rate of 48% but a positive Expt Pts of +1.11 indicating harder shots were converted). Dig a little deeper though and 21 of those 27 shots were taken under no – or very little – pressure (another indictment of the Derry defence). Yes the next day their frees, or goal chances, might compensate for more pressurised point attempts. But what happens in August when they don’t get a goal, get five frees instead of 11 in a game and their shooting comes under a lot more pressure? Free taking has been a problem for Tyrone. Over the last 3 Championships they have returned a poor 61% (0 – 39 from 64; Expt Pts -4.00). This 61% is in stark contrast to a combined 84% from Rock & C O’Connor over the last two years. Against Derry they were 73% (0 – 08 from 11; Expt Pts -0.50). Again – in a game with little or no pressure – their shooting was below average. The one bright spark was Séan Cavanagh who hit 0 – 06 from7 (86%; Expt Pts +0.38). As the above table shows he hasn’t taken many frees of late but when he did he was accurate. That flowed through to this game. As a designated starter, and given Tyrone’s travails of late, it may be best for Tyrone’s to leave him on the frees. If he does nothing more than hit average then this will be an improvement.